The lab develops and uses a mixture of simulation- and experiment-based techniques for research in wind and marine renewable energy. A foundation of our approach is using simulations to check understanding of a problem and efficiently analyze possible solutions. Simulations are usually developed with in-house or open-source tools, avoiding the “black box” limitations of proprietary software. We use established tools such as FAST and MoorDyn for wind and marine renewables simulation, and the Python environment for custom analysis across a range of application areas. Measurement and physical testing comes into play for characterizing real-world behaviours, checking prototypes, assessing performance of designs, and validating new simulation tools. For wind and marine renewables, emphasis is on dynamic testing, which involve the measurement and control of forces and motions, such as is applicable for wind and marine renewable energy structures. We have equipment for wave tank testing, cable-based actuation, and real-time control including hardware-in-the-loop simulation applications. 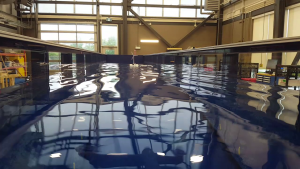 A wave tank is being finished at UPEI. The tank will enable testing of fixed and floating structures in polychromatic sea states, with the option of wind loads emulated by force-controlled cable actuation or fan thrusters.